I had the pleasure of meeting Heidi St. John a few years ago when she came to our State homeschool convention. I was so excited and attended all of her sessions. Unfortunately, I left without purchasing any of her books because of time constraints. 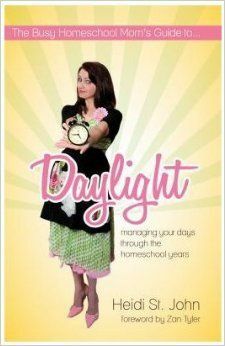 So, you can be sure I was equally excited to be selected to review The Busy Homeschool Mom's Guide to Daylight from Real Life Press. Real Life Press is the brainchild of Jay and Heidi St. John who have created this company to help you keep your family firmly planted in the word. With seven children of their own from toddler to adult they strive to guide their readers towards the age-old Truths as the basis for our sense of self-worth, identity, purpose and happiness. For me, my season is filled with a mobile baby to young adults and everything in between. My homeschool experience will not look like yours. Focusing on your current season and not letting the comparison bug into your hear you will succeed on this journey of homeschooling. There is no need to be a ‘supermom” when God is at the center of your life leading and guiding you. Once my copy arrived, I read the entire book, cover to cover that same night. I couldn’t put it down! With so many ideas and tips to make my days go just a bit more smoothly was so exhilarating. I went back and re-read each chapter a second time and took notes of the changes that I wanted to make within our household. One of the biggest changes we have implemented is the zone cleaning schedule. With Marie about to head off to college I have realigned her chores so that Madison and Mikayla become a little bit more proficient at what she used to do. It really helped in our daily cleaning to be able to tell the girls to clean their zone. Not to mention the fact that the house is so much easier to clean since we have made major headway in de-cluttering! It’s amazing how much “stuff” you can accumulate. Overall, I recommend this book for everyone, homeschool mom or not! There is sure to be some helpful tips for your household in the pages of this book. Also, be sure to check out the other products being reviewed, Firmly Planted, Gospels, Part 1, Firmly Planted, Gospels, Part 2, Firmly Planted, Books of Moses, Part 2, The Busy Homeschool Mom's Guide to Romance , and Lapbooking Made Simple by clicking the banner below.